We want more free festivals at Stonehenge, and free access into the Stones at Solstice and Equinox sunrises for all who come in peace. and this page is now scintro.htm. 1997: summer is here, are you walking ? Have you seen the Stonehenge VE Day book recently? Stonehenge Campaign websites: here, @geo | Stonehenge2 @ait -with Calendar and Contacts . Webpages here: home | datelist | intro (this page) | news | pictures | VE-Day | weblinks . Stonehenge Introduction webpage contents:- top | latest | contents | Appeal | Art | Badges | Beanfield | Calendar | Datelist | Contact us | Contacts | Contents | Contact us | stoneday.htm | Druids | Egroup | English Heriticage | Equinoxes | filelist? | FIN | stonefin.htm | Festivals | Frames | Friends | Georges | Glastonbury | Help us | Link to Stonehenge | Music | News | Pictures | Roads | A303 | A304 | sitemap | Solstices | Summer Solstice | Torriano | Videos | VE Day 1995 | Walks | Winter Solstices | Weblinks (stoneweb.htm) | Websites | Webnotes | ascii . some URLs . jumper . end . thanks . The Stonehenge Campaign exists to lobby, campaign, attend meetings, raise public awareness,and maintain links with interested parties for the reinstatement of the Stonehenge Peoples Free Festival and of religious access to Stonehenge itself, and to protect the Stonehenge landscape and environment. The Campaign holds monthly meetings in London on the first Wednesday of each month from September to May (except January), to which all are welcome. We always need help with - money, stamps, stationery, artwork, info and dates of events, gigs, demos, festivals, gatherings, etc. We also welcome letters or articles for possible inclusion in the newsletter to express a wider gamut of views. more are in our printed newsletters, badges, and teeshirts, send us yours , and we'll probably stick it here on the web, and include it in our next newsletter. on the 1st of June 1985 Thatcher's police ambushed our convoy which was heading for Stonehenge to set up the 12th (?) consecutive Stonehenge Free Festival. is a hypertext datelist of stonehengey and alturnactive events. the Contacts list from our last newsletter is @ait. It is perhaps 99% accurate. all the info in it, and much more, was included in my hypertext stonefin.htm , which is perhaps 90% accurate. (I'm reinventing that file, deleting redundant information, see below which is designed to be in a frame to the left of your computer's monitor. Some of us are druids, some are not. See the letter from Rev Scobie in our newsletter. join the stonehengepeace egroup - see http://groups.yahoo.com/group/stonehengepeace for archive of messages, and/or post to it. English Heritage claim to "own" Stonehenge. But Cecil Chubb 'gave' it to the nation. But the English only arrived in Britain after the Romans when Stonehenge was already a ruin! English heritcage have plans to develop Stonehenge on a grand scale, with restaurants and millions of tourists. They have plans for a a Stonehenge Park, with which we agree in principle; and they say they want to close the A344 road which cuts Stonehenge - so why haven't they??? Above is the new logo English Heritage are going to use to 'promote' Stonehenge. They paid �10,000 for it. Lots of groups have set up Fin Cells. See our Contacts List @ait and stonefin.htm . If there isn't a FIN cell in your area then start one! GUILFIN are on the web. was a massive contacts list with hyperlinks and more! 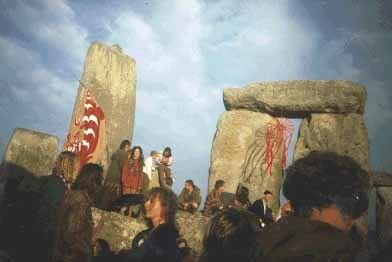 From 1974 to 1984 there was a Free Festival at Stonehenge. It was 90% great. Someone should write more about it here. HAWKWIND ???? played 'rock music' at Stonehenge Free Festival in 1984 (and many other years) There exists a video of them then, has anyone got it, could you grab it and put it here? Now (January 1997) I'm developing a frames version of the website, to ease navigation (and for a CIT certificate). click the lower left flag window several times and see Sarah wave her psychedelic translucent flag! If you're not using frames, almost everything can be accessed from our homepage, stonecam.htm . See the jumper block at the bottom of most webpages, or for a longer list visit our weblinks bookmark page. On VEDay 1995 we jumped the fence at sunrise and spent all day in the Stones! It is the centre of my life. many poems, pictures, videos, Stonehenge V.E. DAY in J's joint by KJ with Star's photo at Jamiriquai's website????? We've been walking from London to Stonehenge since 1986, (BC). This year, 1997 we're meeting at Battersea Park Peace Pagoda at noon on Sunday the 1st of June for a picnic ( with musical jam);and leaving the park at 2 (ish). There's usually a van or boat to carry your kit, and a free meal at the end of the first day's walk. At the winter solstices the sun rises at it's southest. Some say the winter sunset is unlucky. I remember taking photos as I approached, but then ran out of film! There's a movie of a midwinter sunrise on the videos webpage. is our links to other sites on the World Wide Web. It should be importable as a bookmark file. other site with latest news, calendar and contacts list. World Peace Builders` Trust 1997 Stonehenge webpages. Many search engines refuse to record websites at geocities, but they record the webpages at WPB. And magazines like Squall Festival Eye 1996 printed the WPB URLs. Stonehenge Campaign original 1996 homepages at KingswayCollege Internet Support Society deleted. (this site was turned off over the Christmas holidays - I hassled them politelyish to at least put a link to our new sites, because the kiss URL is printed in many magazines etc, but found them too busy and thatcheroid). It was good while it lasted. Chris Lane, who was my Internet Tutor was an inspiration - I wonder where he's now? me: george@dicenews.com (somewhere in American hyperspace) typing into this little laptop in my bus by windmill power... twazzock ! Webspace wanted for the 40meg of videos and sounds from VE Day 1995 etcetera... where can they go, should they be shockwaved or quicktimed or what??? For more stonehengy sites see stoneweb.htm Weblinks page.